A well-appointed turtle aquarium provides everything your reptilian pet needs to enjoy life. Set up the aquarium before you purchase your pet, so you have room to tinker without disrupting his home. To ensure your pet has adequate space, use at least a 20-gallon tank. Turtles tend to prefer water that's warmer than room temperature, which makes a tank heater necessary. The exact water temperature depends on the species; each has a preference. Look for an underwater heater that attaches to aquarium glass with suction cups. Also buy a tank thermometer to monitor the temperature. Heaters may not be accurate so relying just on the heater to regulate the temperature may leave your turtle too cold or too hot. 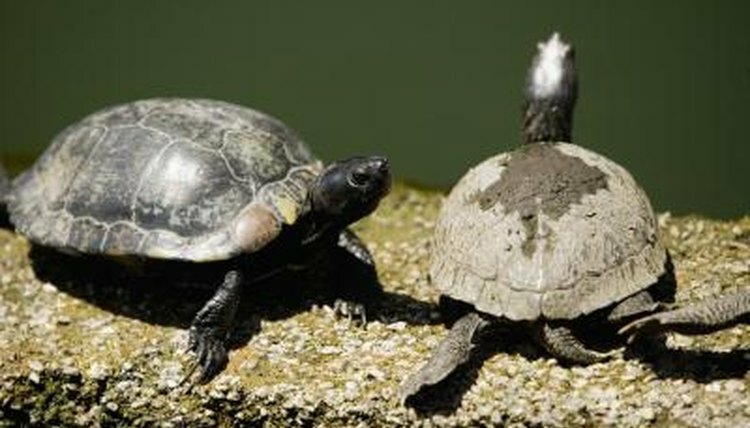 Both semi-aquatic and aquatic turtles enjoy basking in the sun. Create a land area in the tank by gluing plastic to the tank glass with waterproof aquarium sealant or piling up rocks to create a land mass. If you choose the latter option, stack the rocks firmly and consider gluing them together so they don't fall and injure your shelled chum. Make a heated spotlight from a clamp light and incandescent bulb to gently warm the land area and encourage basking. While aquatic plants aren't necessary for a turtle aquarium, they can help the tank appear more natural. Find plants including water lettuce, water lily, water hyacinth, aquatic grass and duckweed at your local pet store. Consider planting rooted plants in the tank's substrate or choose floating plants, such as duckweed, so the turtle won't uproot the plants when moving around. A water filter removes impurities from the tank water. Look for a submersible filter that doesn't require an air pump. For a large tank, consider a more expensive canister filter. These require fewer water and filter changes, saving time. Avoid under-gravel filters for turtle tanks, since these can become too clogged with turtle waste to perform well. A fluorescent light can help regulate the day length for your pet. Nocturnal turtles generally don't need lights, but those active in the day -- including sliders and painted turtles -- benefit from artificial light. "Turtle: Your Happy Healthy Pet"; Lenny Flank Jr.